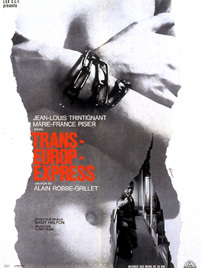 The high-water mark defining the end of a decade long romance between experimental fiction and post-Classical French Cinema is surely Alain Robbe-Grillet’s Trans-Europ Express. Many of the elements of his daringly rule-breaking screenplay – temporal dislocation, narrative rejigging, ellipses, and playfulness, not to mention several very unreliable narrators – have today again, forty years later, become the playground of more innovative directors. And in a period when the script guru rules and the “dream manuals” (Robert McKee, Syd Field, Linda Segar) – books that offer to teach you how to achieve instant success at the altar of Hollywood – continue to outsell almost any other non-fiction category (apart from dietary advice), Trans-Europ Express still has plenty to say to us. The transforming power of French artistic thought, which for so long had seemed the cultural centre of the universe and certainly of the avant-garde, meant that both the nouveau roman (new novel) and the nouvelle vague (French New Wave film) seemed to arrive within an instant of each other. In fact the nouveau roman first emerged in the 1950s and amongst its key practitioners was a novelist who only later became a screenwriter and director: Alain Robbe-Grillet. The new novel as a form attracted writers from Samuel Beckett to Nathalie Sarraute and Marguerite Duras and some, like Duras, also went on to make movies. Maybe a sense that the tired classical realist novel needed a shot in the arm is what drove these writers to formal experimentation in the first place, but few failed to recognise that the feature film was an even more ideal medium to play around with – and its audience was larger and more forgiving. In Pour un Nouveau Roman (1963), Robbe-Grillet argues that the “traditional novel”, with its obsessional unities of time and place and omniscient narrators, creates the mere illusion of order in a disordered and chancy (“aleatory”) world. The role of the “new novel” then was to assist change by throwing out any techniques which tried to impose order or a particular interpretation on events. In other words, ambiguity was to be the new order. This, of course, all sounds a lot like such similar manifestos as Marinetti’s Futurist Manifesto (written in 1909, just five years before World War I) – and was certainly in large part a reaction to the horrors and insanities of both World Wars, as well as specific modernist tendencies in art. Not surprising, then, that Robbe-Grillet would look to film with its infinite narrative possibilities as a battleground for trying out new and provocative ways of storytelling. By 1961 Robbe-Grillet had launched a new (or at least simultaneous) career as a screen-writer and director, starting with the 1961 Venice Golden Lion winner, the elegant, cold and beautiful L’Année dernière à Marienbad (Alain Resnais). Then as writer and director he made L’Immortelle (which won the Louis Delluc prize in 1963) before his most successful and accessible experimental work, Trans-Europ Express three years later – quite a dazzling trio for a one-time darling of that rather restricted field: the avant-garde. From its opening scenes, and aided by Willy Kurant’s crisp and elegant black-and-white images, Trans-Europ Express offers all the pleasures of a more traditional example of the thriller genre. The location is that most familiar of classic thriller settings, the Trans-Europ Express itself (Paris to Antwerp), though this time the travellers are not Hercule Poirot and his supporting cast but rather a small team of “above the line” filmmakers. They are a writer-director (played by Robbe-Grillet himself), a producer and the production secretary (though by now the American term “script girl” was making its way into screen credits for the first time). The team discuss a thriller they want to make, and as they chat we cut to another traveller on the express. We now shift to inside the movie they’re talking about and we see a drug-smuggler on his way to Antwerp to collect a shipment of cocaine. This fictional smuggler is a man in a rather silly fake beard and glasses (it’s actually Jean-Louis Trintignant but we don’t recognise him). The filmmakers now set in motion a series of reworkings of what we have just seen onscreen. The director remarks that he’d rather have Trintignant than the bearded actor. Trintignant himself (sans beard) now suddenly appears as the smuggler Elias. A narrative game is thus set in motion. This game is the plot motor that drives the rest of the movie – a plot constantly in flux at the whim of the “filmmakers”. From now on the two parallel worlds of the film itself, its characters and authors, and a different or parallel narrative space interweave and collide as the filmmakers constantly change their minds, rewrite on the run, and generally put Trintignant/Elias through a surreal hall of narrative mirrors as the plot is chopped and changed. Prostitutes, phony cops, characters and tiny details, all change as the “creative” process runs wild. The result is both a pure example of narrative deconstruction – with some genuinely absurd moments – and a pretty weird experience for the viewer; and at times for Trintignant who is playing both himself and his screen persona of Elias, the drug runner. The film’s title is itself full of typical Gallic literary allusions, with Transes being the name of a detective story included in the film; Europe, an adult magazine that we see a character buy; and L’Express a popular French magazine. As Roland Barthes might have put it (indeed, did) this is a text that is both playful, knowing and full of pleasure (plaisir du texte) for the viewer/reader as well as, presumably, for the film workers who made it. In the early twenty-first century, such recent cinematic innovators such as Tom Tykwer (Run Lola Run, 1998), screenwriter Charlie Kaufman (Adaptation [Spike Jonze, 2002] and Eternal Sunshine of the Spotless Mind [Michel Gondry, 2004]) and writer-director Christopher Nolan (Memento, 2000), all owe more than they may realise to Alain Robbe-Grillet. In a way that Robbe-Grillet could perhaps never have anticipated, Trans-Europ Express is as challenging and influential again today as it was in the 1960s – a key text of the postwar European avant-garde. But it is, above all, as an enjoyable and witty movie that this film has remained a classic and emblematic work. Its influence is also evidence, if anyone still needed it, of the great difference between high solemnity and simple and yet entertaining seriousness (1). For further reading on Robbe-Grillet and his place in French cinema read: Guy Austin, Contemporary French Cinema: An Introduction, Manchester University Press, Manchester, 1996; Marjorie H. Hellerstein, Inventing the Real World: The Art of Alain Robbe-Grillet, Susquehanna University Press, Selingrove, 1998; and Remi Lanzoni, French Cinema: From its Beginnings to the Present, Continuum Publishing, New York, 2002.